Is there anything better than good old classic chocolate chip cookies? Especially homemade chocolate chip cookies? I swear, somedays I see the dried, oily packaged Mr. Christie cookies at the supermarket and I can’t believe people buy and enjoy them. Or that as a child, I used to enjoy them. 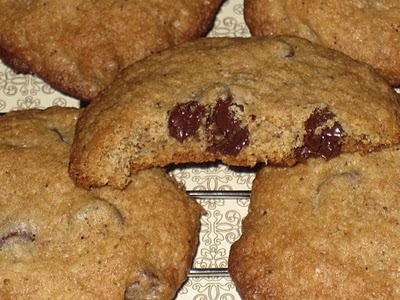 This is the chocolate chip recipe I used growing up. The first time I remember making them myself with no help, I was around 11 when my mother was pregnant with my sister and had a hard time cooking without getting nausea. From then on afterwards, I had to double the recipe, as with four people (later five) in the house, the cookies wouldn’t last very long. After my final cake decorating class last week, I’ve been trying to use up all my leftover buttercream icing. I made a ton of green icing, thinking that I would use most of it for leaves and stems on my roses, but I guess I still need to learn about icing quantity. 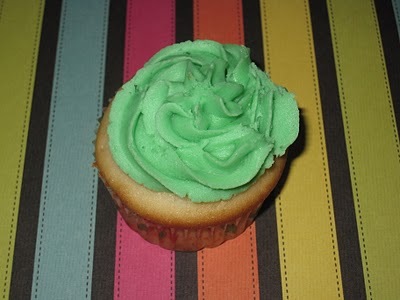 And since it’s March 17 aka St. Patrick’s Day, green icing cupcakes make perfect sense! But if you are looking for a to-die-for green-themed recipe, I highly recommend Bridget over at Bake at 350, as she did the unthinkable and made Mint Cream Cheese Brownies. It’s like she was aware of everything that I love and decided to combine it all into one sinful dessert. I can’t make it because I might accidentally eat the whole pan while re-watching Glee. Then I’d have to do my yoga dvd a billion times to cancel it all out and fit into my work pants the next day. But you should try it, because its very likely you’ll have more self control than I do. This way, you can also torture me by telling me how awesome it is. Lastly, I also have some very excellent news! I’m set to take a one day cupcake decorating class in April over at Le Dolci, courtesy of Groupon and their amazing 50% off deals. (By the way, I highly recommend joining Groupon, as its a great way to find out the new events and deals in your city). I’m hoping this will be more beneficial than taking the Michael’s cake decorating classes, as cupcakes are cuter and easier to handle. (You can read about the last three classes – Day 1, Day 2, and Day 3). Is it though? I’m having a hard time believing it. At the beginning of the week, it snowed, but now it’s raining. I seriously haven’t seen the sun in about five days. Isn’t seeing the sun once in a while supposed to be part of the whole spring thing? Hehe, spring thing. (Don’t mind me, I’m tired, its been a long, non-baking kind of day). I didn’t have anything interesting to write on my final cake for my Michael’s basic cake decorating class last night, but I did enjoy learning to make the roses. These are called ribbon roses and they are the simplest roses to make. 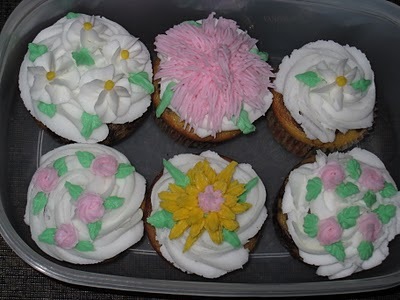 I had a bit of a hard time because my icing was a little soft (stiff icing is key for making these). I also loved the border. I attempted the border shell, but the icing decided it had a mind of its own halfway around the cake. 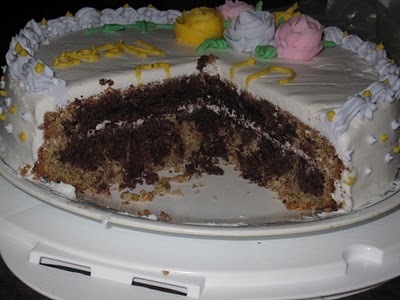 The cake was a homemade marble cake made with almond milk (thinking of Trevor’s milk allergy) and whole wheat flour (long story, but I made the cake during a snow storm and I ran out of white flour) with almond-flavoured buttercream. It was a little dense, but Trevor loved it. 1). After icing your cake, do you still see spatula markings all over the surface? My teacher had a great idea how to smooth it. Let the cake sit for 10 minutes to let the icing stiffen slightly, then place a sheet of parchment paper over the top of the iced cake and gently use the spatula over the paper to smooth out the creases and lines. I did it in the beginning of class and it made my icing look much more smooth and even. 2). 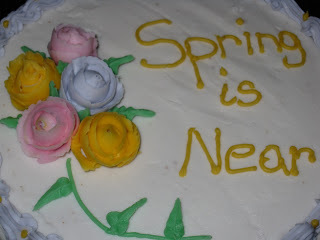 Use a long piece of thread to drape over the iced cake to help line up your lettering before you write on your cake. 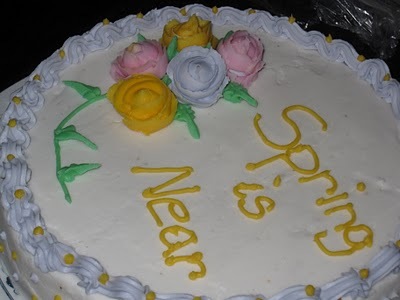 This helps keep the words straight (something I didn’t have on me) and it is removed in a pinch with minimal markings to the surface of the cake. 3). 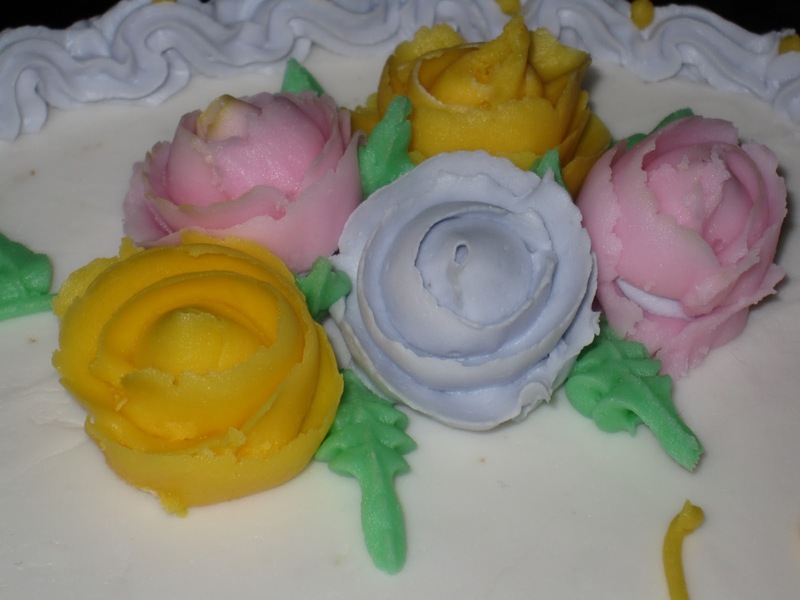 Rather than having your roses laying flat on the cake, give them more dimension by places a small glob of icing (preferably the colour of the iced cake or the rose itself) on the surface of the cake and gently place the rose on top. I did that and it made the flowers stick out a bit more at different angles. I was planning on taking the next level class right away, but they are all filled up until the beginning of April. Plus, I’m not sure what my schedule is going to be for the next couple of weeks, so I don’t want to commit to a class until I have a few other things in my life straightened out. 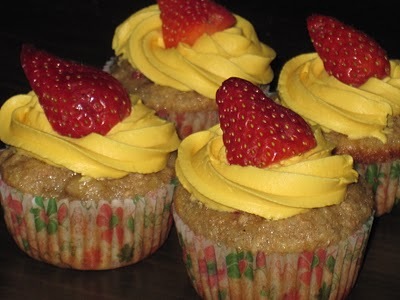 I wasn’t going to post these pictures, but I just realized that a bunch of people have been dropping by my little baking site through The Cupcake Blog. I checked it out and discovered that they seemed to have liked this photo from my flickr account and were awesome enough to share it with their viewers. So I figured why I should explain why I never posted this photo here until now……. A couple weeks ago, I had a bunch of really ripe bananas. Usually, I make banana muffins, but I decided to try something new. I googled a recipe for banana cupcakes and thought it would be fun to try. 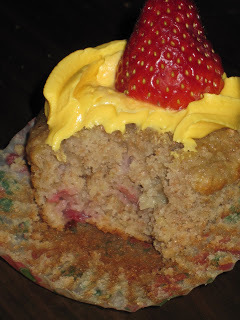 I even had a basket of strawberries that I needed to use up and what’s more perfect that the combination of bananas and strawberries, especially in a delicious cupcake? Well, they didn’t turn out the way I was expecting. I’m not sure what it was, but maybe I’ll always associate cooked bananas more with muffins than cupcakes. The cupcakes had more of an oily, dense texture than the fluffy, cake-like texture I was looking for. I dressed it up with icing to make it look pretty, but I was a little disappointed. 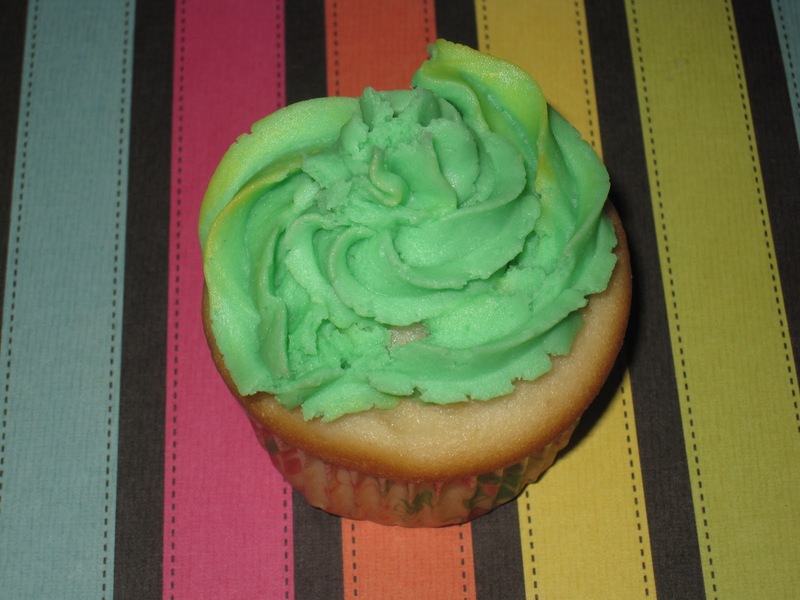 There was nothing really cupcake-like about it, more like a heavy muffin with frosting. And that is why I didn’t post it. If they had turned out perfectly, it would have made a lovely posting and I would have shared the recipe with everyone. Unfortunately, I don’t want people to be disappointed with recipes that I post, so I didn’t bother. I liked the photo though, so I posted it to flickr and thought nothing more of it. Until now. Thanks again Cupcake Blog! 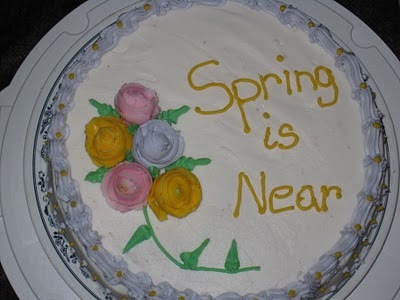 (To catch up, you can go back and read about Day 1 and Day 2 of my basic cake class). I can’t believe I decorated these cupcakes! Every time I look at them, I get a little giddy inside. Next week for the last class, we are doing a large cake again, but this will probably end up being my most favourite class out of the level 1 basic decorating classes. We ended up using a lot of tips to create all the flowers and petals. I’ll go through them with you and link the techniques that are demonstrated on the Wilton website (although I highly recommend learning from someone, as they can help you correct your mistakes). The recipe for the icing I used can be found here.